Rotafix Epoxy Putty is a 2-part system used for repairing damaged concrete, to seal metal pipes and to prevent water penetration. Rotafix Epoxy Putty will cure at zero deg c. and have an open time of 40 minutes. The two liquid components of when mixed create non-shrinking, gap filling putty that can be hand or spatula applied. 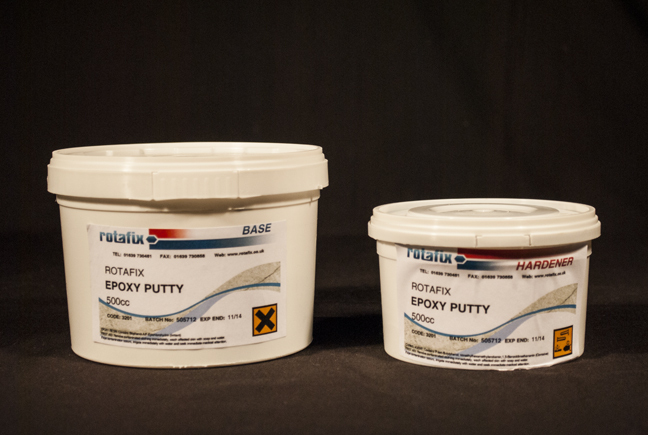 Rotafix Epoxy Putty is a flexible repair product that can be used to repair metallic components, stone, and masonry and is ideal for surrounding pipes passing through holes in walls.